A while back we talked about how Jaguar was intending a plug-in hybrid, along with Rover. See our: Jaguar Announces 200 C-X75 Plug-In Hybrids. A few weeks later and Rover is saying it is going into production, according to AutoExpress. Somehow, Jaguar Land Rover, JLR is not very forthright about details. 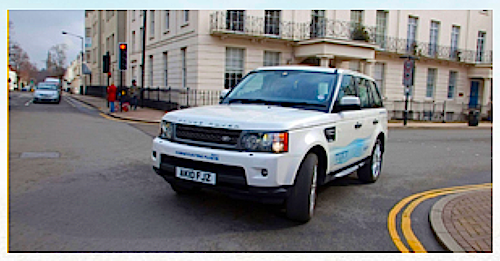 Land Rover Plug-In Hybrid. Land Rover is now confirming it will bring to market the plug-in hybrid Range Rover. So far, the intention is only for the European market but nothing has been said about the U.S. In many ways, it would be foolish for JLR to not bring its plug-in hybrid Rover to the U.S. Plug-in hybrids are popping up everywhere with an onslaught from car manufacturers across the globe. Yet, according to Peter Richings, chief hybrid technology engineer at JLR, the Range Rover plug-in hybrid could hit the streets sometime between 2015 to 2020. So what is the hold up? JLR is not giving us a firm date and only alludes to the European market where diesel is more readily accepted. One thing this could mean is that JLR is either waiting to fine tweak the necessary components before a mass-production schedule or that the company has one other car it wants to deliver before introducing the PHEV. Your guess is as good as ours. To put everything into perspective, we all know Rovers are not the most gasoline frugal sipping vehicles on the planet. Sure, you can drive up a tree with a Rover, escalade the Great Pyramids and this true SUV will never let you down. In fact, the Camel Trophy has really shown us all a Rover can do, sometimes to the point of making grown men breakdown and cry. But all of this comes it at a price, virtually in dollars and gasoline consumption. Still, how likely is it that JLR would bring us a plug-in hybrid, and even more interesting bypassing the common hybrid passage? The prototype it presented us with the Range_e uses a 3.0-liter V-6 coupled to a 69kW electric motor pumping its electricity from a 14.2 kWh lithium-ion battery pack. This wouldn’t be an Earth shattering plug-in hybrid when considering the what the competition has to offer but it would certainly give JLR some much needed eco-friendly number to boast. In the meantime, JLR is also working on another drivetain in parallel, the Jaguar XJ_e, which uses the turbocharged 2L engine, coupled to a 69kW electric motor feeding itself from a 12.3 kWh lithium-ion battery pack. No matter how we look at it, most carmakers will have to adopt some sort of electrification in order to meet the overwhelming demand to lower gasoline consumption. Rover will have to produce a plug-in hybrid and have it ready for the U.S. market in a few years.